We had a rocky and noisy night at Clarksville with tows going back and forth. We were glad to leave early for the 70 mile cruise to Barkley Lake. The trip was uneventful, with few boats until we passed under the Highway 68 Bridge. This is the last big boating weekend of the year. By tomorrow night we will have the river to ourselves. We were greeted by Greg, the resort owner who helped us dock. I was surprised to see that the resort is now a KOA (Kampgrounds of America). Greg said KOA will soon have different brands so visitors will be able to have a better idea of what to expect. On our motorhome trips we found a wide range in the quality of KOA campgrounds. 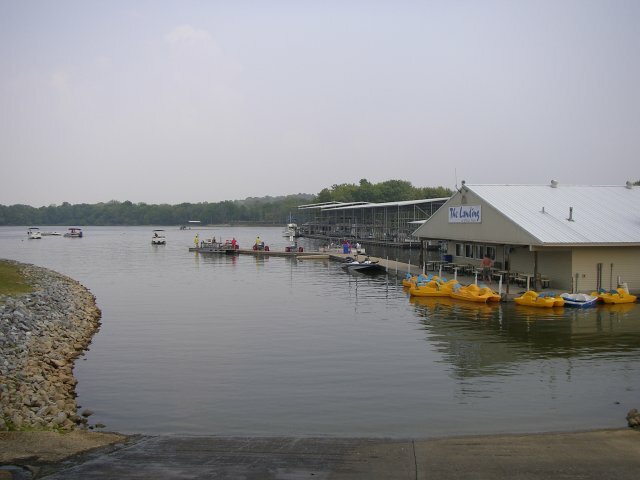 Prizer Point is focused on family vacations with the marina, campground, and cabins. There is a ton of stuff to entertain kids with playground, minature golf, a floating iceberg, paddle boats, video games, etc. He is going to establish a floating village along some of the shoreline he owns. We have stayed here twice in past years and have always been impressed with the quality of the marina and the friendliness of the staff. Verizon works well here, unlike Barkley Lake Marina which is just 4 miles south.